Penny For London is a support programme which is backed by the Mayor of London – Boris Johnson. It’s set up to provide children and young people with funding for community projects and ventures. It aims to enrich lives and provides much needed extra curricular education for young people from deprived areas in the city of London. As well as setting up breakfast clubs, reading and numeracy projects, sports coaching and helping children with the transition between primary and secondary school, the group also help to provide young adults with work and training opportunities and also help young creative people to develop and improve their skills, enabling them to find work. Garment Printing always supports charities and support networks for people in need. Our slogan is “Together, Creating Impressions That Last”. “Your pennies turn quickly into pounds and that money goes towards helping young people have a better chance than they would have had.” Penny for London team. 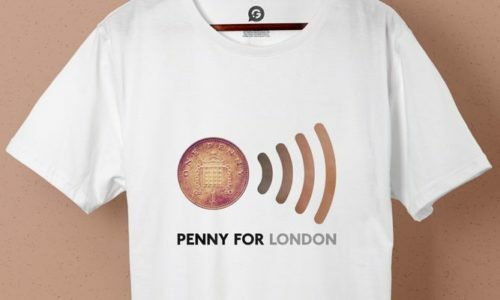 Penny For London required 365 printed T Shirts for their latest campaign but it needed to be within a set budget. The challenge for us was to meet the challenge of a very fast turnaround time whilst working within the budget constraints of the charity. As the event was coming up soon we gave them a quote which was within their budget and included same day print and next day delivery services to ensure that all the T Shirts was received in time. The fastest printing technique was Direct To Garment printing. It also uses eco-friendly water based inks which is the perfect solution of high-quality printing and it allowed us to remain eco-friendly at the same time. The first thing we had to agree was the T Shirt. Due to the budget constraints we went for the Fruit of the Loom 100% organic original Full Cut Tee. This is a popular choice as a promotional T Shirt due to it’s stylish looks, comfort and it’s low price. Using DTG printing we was able to agree the artwork and send it to print quickly and efficiently. From there our expert printers were able to program the design into their machinery and the printing was completed within a few hours. We then used a next day delivery service to send the printed T Shirts out to the customer to ensure that it was received by them within plenty of time for their fund raising event.